Brass plating is one of the oldest forms of metal finishing. Depending upon the ratio of copper to zinc, brass has a wide range of colors from yellow to white. Unlike gold, brass will eventually tarnish as a result due to oxidization. Instead, cleaning brass with a multitude of commercial cleaners is completely normal. If your brass is green or too far gone, we can polish it with our machines to bring it back to life! Over the years, the uses of brass plating have primarily served aesthetic purposes, with thinly coated plates over bright nickel or other bright plating materials. Buffing or burnishing creates a shiny smooth finish therefore we can use heavier metals. In contrast, treating heavier metals to produces an antique finishes in a darker brown or black. Relieving these finishes through tumbling or brushing to produce highlights. 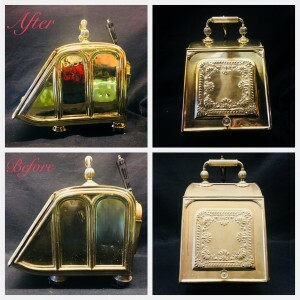 Brass restoration is a common practice at American Plating Company. It is important to know your limits when it comes to polishing antiques. If we polish too much we can actually destroy the intricate details or engravings that make brass antiques so special in the first place. If we feel we have reached our limit, we always contact our customers to let them know what issues we are having. It is important to note, however, that brass can also provide important industrial functions. For example, brass plating can be used on aluminum (zincated) prior to nickel plating in order to optimize rubber bonding. This procedure is best highlighted in the creation of steel tire cord wire, where the bonding of the steel to the rubber depends on brass plating the steel wire. Generally, the brass plating is on heavier wire, which is drawn after plating to the final size without destroying the brass plate. Strow, Henery. “Brass and Bronze Plating.” Metal Finishign 105.10 (2007): 163-67. Web. 30 July 2015.